The Healthy Life: Healthy Homemade Hot Sauce! 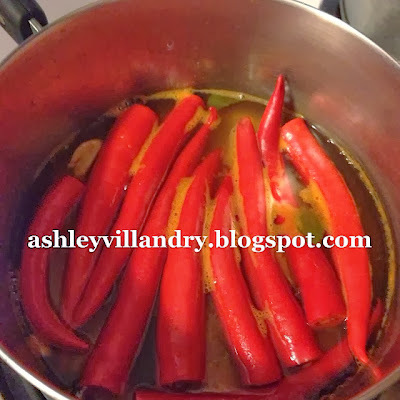 Rinse and remove the tops from the peppers and place into a medium, non-reactive sauce pan (i.e. ceramic or stainless steel). Add remaining ingredients and bring to a boil. Reduce heat to low/medium-low, cover and let simmer for 20-25 minutes, or until the peppers are soft and tender. Once peppers are soft add to a food processor, blender, or Vitamix and blend until smooth. If end result does not end in a smooth puree, strain through a fine sieve and discard any sediment it catches. Return to sauce pan and simmer on low for another 15 minutes. Place in an airtight glass container and refrigerate overnight. While mine never lasts this long, it can save for about 5-6 months when refrigerated in airtight container, but always check for mold or signs or spoil before using. Wow!!! Nice recipe. It is awesome and great for health. I will also make it at home. Total Cleanse Detox Diet is a firm which aware everybody about their eating regimen plan to keep solid by including bunches of water and liquids in your schedule. To keep sound and clean your kidney through homemade detox cleanse or beverages loads of water and numerous liquid materials in your day by day diet. This procedure will likewise help your kidney from stomach related sicknesses like kidney stone and so forth. I just made this recipe. ............it's a tiny batch. I bought a jar similar to yours to store it, but realized the batch would barely cover the bottom. Ended up putting it in a jam tester jar, it's still only about 3 Tbsp worth. I was barely able to find 10 healthy organic cayenne peppers at the market today (I went late). Next week I'll buy 40 cayenne peppers and try a bigger batch. Does it still keep it's flavour when multiplied? I took a taste before putting it in the fridge, awesome flavour! Since lowering my sodium to bring my blood pressure down, I've found food has no flavour. I make fresh salsa with fruit to mask the lack of salt, but I so miss hot wings. 1/2 a chicken breast dipped in this hot sauce will hit the spot I'm sure! Thanks for posting this recipe.